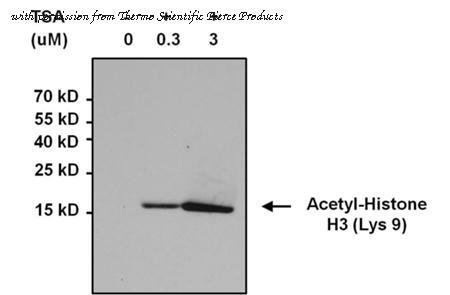 Immunoprecipitation of acetylated Histone H3 (Lys9) was performed using whole cell lysates from cells left untreated (DMSO only) or cells treated with 0.3uM or 3uM Trichostatin A (TSA) for 16 hours. Antigen-antibody complexes were formed by incubating 500ug of the indicated lysate with 3ug of an Acetyl Lysine monoclonal antibody (Product # MA1-2021) overnight on a rocking platform at 4°C. The immune complexes were captured on 50ul Protein A/G Agarose (Product # 20421), washed extensively, and eluted with 5X Lane Marker Reducing Sample Buffer (Product # 39000). Samples were resolved on a 4-20% Tris-HCl polyacrylamide gel, transferred to a PVDF membrane, and blocked with 5% BSA/TBS-0.1%Tween for at least 1 hour. The membrane was probed with an Acetyl-Histone H3 (Lys9) monoclonal antibody (Product # MA5-11195) at a dilution of 1:1000 overnight rotating at 4°C, washed in TBST, and probed with Clean-blot IP Detection Reagent (Product # 21230) at a dilution of 1:2000 for at least 1 hour. Chemiluminescent detection was performed using SuperSignal West Pico (Product # 34087). we manually curate antibody information from literature in order to obtain a comprehensive set of well-validated antibodies.